Italian Maurizio Sarri has been named new Chelsea head coach. He moves to Stamford Bridge following a successful three-year spell in Italy. He has signed a three-year contract with The Blues and will take over immediately the dramatic departure of Antonio Conte. Here are things you may have not known about the new Chelsea Boss. *Sarri was born on 10 January 1959, in the Bagnoli district of Naples, Italy. *Sarri began his coaching career in a part-time capacity while working in the banking industry following a short spell as an amateur player. *Sarri likes his teams to play a dynamic style of football with the focus on quick passing, even in deep positions, and ball retention, encouraging the players to be forward-thinking in their approach. *Sarri whose Napoli side had concluded the first half of the 2016–17 season Serie A in 1st place, gained the title “Campioni d’Inverno” (“Winter Champions”) for the first time in 26 years. *Maurizio Sarri will be the 12th Italian to manage in the Premier League , and the sixth to do so for Chelsea after Vialli, Ranieri, Ancelotti, Di Matteo and Conte. *Sarri becomes Chelsea’s 13th permanent boss of Roman Abramovich’s ownership, which began in June 2003. 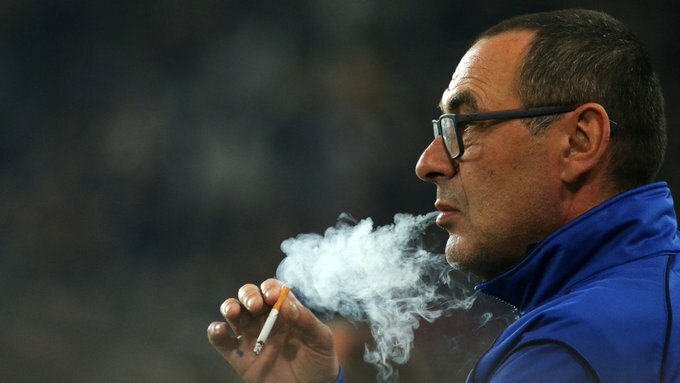 *Sarri is well known for his smoking habit, and is often seen smoking during games. In 2018, Napoli’s UEFA Europa League opponents, RB Leipzig , built a special smoking section in the locker-room area of their stadium, specifically for Sarri.